Grizzly Bear is a rock band from Brooklyn, New York. Their music uses melody and ambiance in conjunction with hazy-eyed choruses, whistles, piano, banjo, and several woodwind instruments. 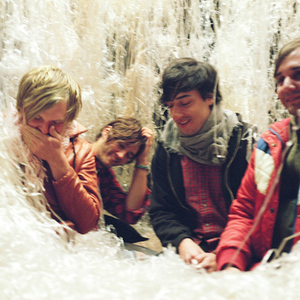 Grizzly Bear was originally the solo project of Edward Droste (vocals/guitar), who recorded his debut album Horn Of Plenty at home. The record was originally meant for his friends, but it eventually circulated and got a proper release in 2004, this time with the help of Christopher Bear (drums/vocals). A re-release with a bonus disc of remixes was issued in 2005. Grizzly Bear was originally the solo project of Edward Droste (vocals/guitar), who recorded his debut album Horn Of Plenty at home. The record was originally meant for his friends, but it eventually circulated and got a proper release in 2004, this time with the help of Christopher Bear (drums/vocals). A re-release with a bonus disc of remixes was issued in 2005. 2005 also saw the addition of the two other band members, Chris Taylor (woodwinds/electronics/engineering/production) and Daniel Rossen (vocals/guitar). Playing as a four piece allowed the complexity of sound that was recorded on Horn of Plenty to be played live. The band toured throughout the year, playing songs off the first album as well as some of the new songs they were collectively writing that would make up Yellow House. An album of Droste's early demo recordings, Sorry for the Delay, was released in 2006. Later that year they signed to Warp to release Yellow House on September 4th, 2006, to great acclaim. In 2007, the band released Friend EP, which features outtakes, alternate versions, and covers done by CSS, Band of Horses, and Atlas Sound. In addition, members of the Dirty Projectors and Beirut collaborated with the band on "Alligator" and the EP's hidden track. The band released their third full length album, Veckatimest, on May 26th of 2009. The Sleeping Ute Songfacts reports that the title of the lead single from Shields, the fourth studio album by Grizzly Bear, refers to a mountain in Utah. "Sleeping Ute" was posted on the band's website on June 5, 2012.